Uses: Used in flavours, meat and sea food industry, Asian cuisine, the oil is rich in antioxidants. It has many medicinal benefits, oil reduces blood pressure. The plant is native to South and Southwest Asia but is believed to have originated in Israel and Egypt. Cumin seed oil is widely used in India, China, Persia, and Mediterranean countries. The plant is cultivated in Cyprus, Morocco, south Europe, Iran, China, and India. Cumin plant is harvested during dry and hot climate. The plants history can be traced back to ancient Egyptians and Assyrians. The oil was used by pharaohs to aid in digestion especially after a heavy feast. In Turkey, cumin was found inside a Hittite flask from the 2nd millennium BCE. 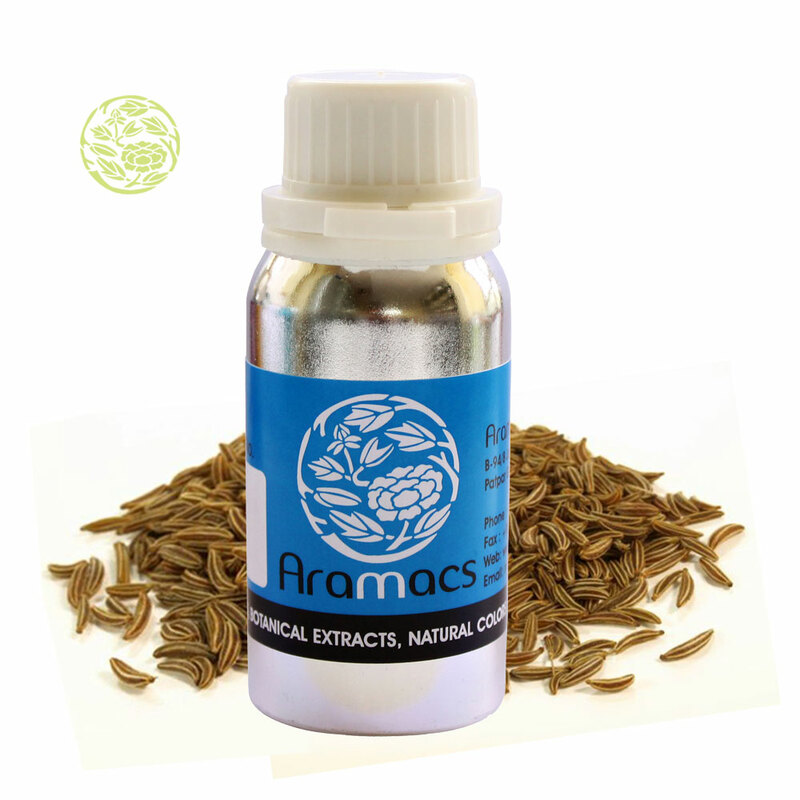 Islamic physicians prescribed cumin seeds for various respiratory problems. 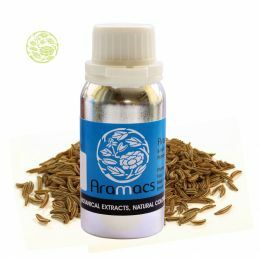 Cumin seed oil is extracted by steam distillation from ripe seeds. The oil is golden brown in color with moderate viscosity and a spicy, pungent flavor. 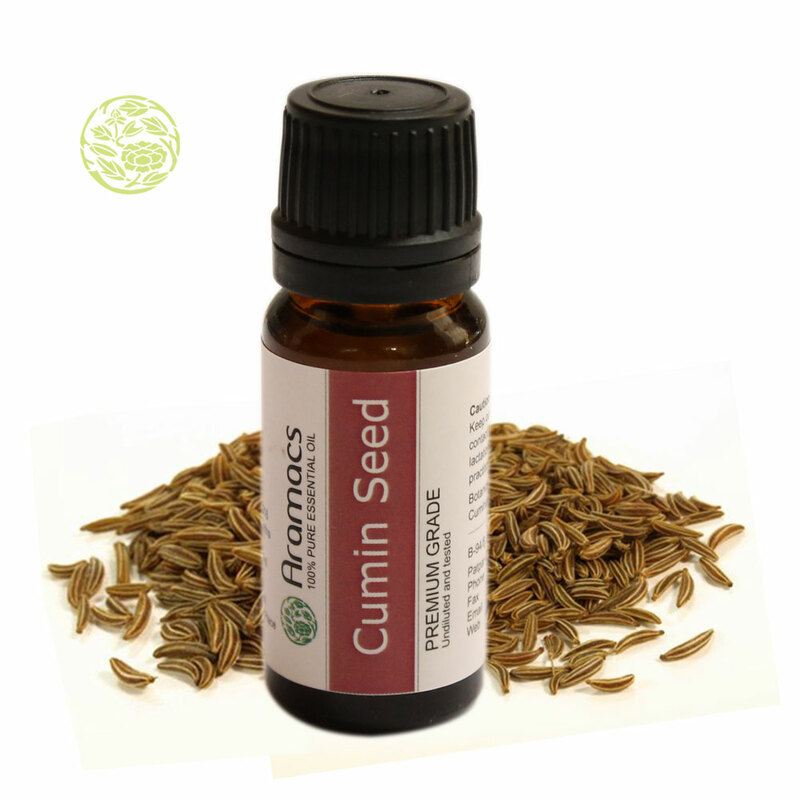 Cumin seed oil is known for its digestive properties. It aids in digestion, stimulates secretion of digestive enzymes, and removes gas from the intestine and stomach. The essential oil of cumin decreases blood pressure. Warm cumin oil eases muscular pains and osteoarthritis. Colic, dyspepsia, bloating, flatulence, and indigestion can be cured using the oil. Cumin seed oil can be used against diabetes, asthma, hay fever, leukemia, allergies, and rheumatism. The oil is perfectly suited for mature and aging skin, dry and cracked skin. In addition, it is beneficial in treating skin conditions such as acne, boils, and psoriasis, eczema. When mixed with honey and garlic, the oil acts a good tonic for people suffering from cold or coughs. Ancient Egyptians used the oil for treating headaches, toothaches, and infections. Studies have showed that the compounds in the oil are effective against fighting diseases and boost the production of the bone marrow and immune cells. The oil flushes out toxins thereby stimulating proper functioning of the liver. Certain recent studies have shown that the oil can assist autoimmune disorders thereby preventing and treating cancer. It stimulates the hormone system thereby treating intestinal parasites, worms, and candida. Lethargy, weak concentration, mental exhaustion, colic in babies, cuts, bruises, gall bladder, and kidney can be treated by the oil. Egyptian Queen Nefertiti was believed to have anointed her skin with cumin seed oil to strengthen and boost her hair and nails. The oil is absorbed easily onto the skin and is included in moisturizers and hair care products. Cumin seed oil is used in breads and casseroles and as a base for salad dressings. Annually 12 tins of cumin seeds oil are produced in Egypt and Spain. In America, the oil is used as a spice and a heath supplement. Cumin ( Cuminum cyminum) is in the parsley category of essential oils. Traditionally this is a conventional central easterly spice and a chief constituent of curries. It is mostly utilised in conventional Ayurvedic medication, chiefly as a stimulus just particularly for digestive complaints as if colic, sluggish digestion and stomach upset. The old Hebrews applied cumin as an bactericidal for circumcision. 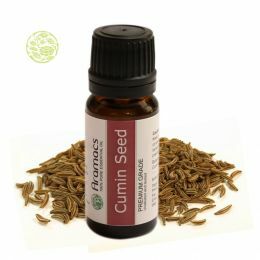 Cumin essential oil has a few exciting features. It is anti-tumoral, anti-inflammatory drug, a antiviral agent, digestive assistance, liver protectantt and an resistant stimulus. It is utilised in cancer, infectious diseases, and for digestive troubles. Cumin could be consumed internally, diluted and implemented to the skin, the chakras/vita flex points, directly breathed in or diffused. It is commonly nonpoisonous, non-irritating, and non-sensitizing yet it's fairly phototoxic meaning you shouldn't enforce this oil to your skin and so expose your skin to the ultraviolet beams of the sun. LOVE THIS!!! Got free sample in packet Awesome!! !